This Tooty Fruity edible bird perch with bee pollen is a fun way to add calcium and bee pollen to your birds diet. Tooty Fruity Edible Bee Pollen Bird perch is made with bee pollen and calcium. There are 22 basic elements in a birds body; enzymes, hormones, vitamins, amino acids and others which must be renewed by nutrient intake. No one food contains them all........except bee pollen! Discover the benefits and healing power of bee pollen. Made with real bee pollen and 100% digestible calcium. Bee Pollen is collected by bees from the blooms of flowering plants. Bee Pollen is one of the most concentrated broad spectrum sources of nutrients. Because pollen is the reproductive spore of plants, it is nutrient rich containing a diverse supply of natural hormones and active enzymes. Pollen is a great source of free amino acids, essential fatty acids which includes the Omega 13 fatty acids, and carbohydrates. 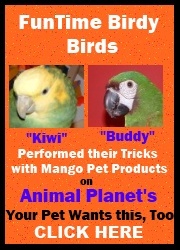 Packed with vitamins and minerals easily absorbed by your bird. Bee pollen can be a powerful supplement for your bird. Tooty Fruity Edible Bird Perch is also an incredible source of calcium. Calcium is needed for strong bones, proper muscle functions and egg development. This bird perch is edible and can be installed vertically or horizontally, as you and your bird desire. It should be installed in the highest possible position of the cage, or vertically on top of the cage. Do not overtighten! Calcium Carbonate, Bentonite Clay, Bee Pollen, Potassium Chloride, Dicalcium Phosphate, Sodium Chloride, Sodium Silicoaluminate, Dextrose, Natural Grape, Kiwi/Lime, or Watermelon Flavors, Potassium Iodide and Sodium Bicarbonate. Small Tooty Fruity Edible Bird Perch for Parakeets and Cockatiels5Bethany ShefferJanuary 31, 2017At first my female cockatiel didn't know what to make of the new tooty fruity perch, but within a few days she was munching away at it and seemed to be enjoying herself quite a bit! Small Tooty Fruity Edible Bird Perch for Parakeets and Cockatiels5Levi & CosetteDecember 8, 2015It always takes us a while to warm up to something new in our cage (it's a budgie thing), but we're so happy we took a chance in this perch. Cosette chews everything she can get her beaker on, so this is really good for her. Every so often when she is not looking, I can sneak in for a little nibble too. We want to try all the flavors!!! Small Tooty Fruity Edible Bird Perch for Parakeets and Cockatiels5FrankieMarch 24, 2013Okay, I admit it...this one took a little getting used to. At first I would try to jump over it, or go around it, to get to my treat dish. Then one day I decided to give it a shot, and it is actually very comfortable. Nice and smooth on the toes. Easy for budgie toes to get a grip. And the best part...it's very tasty when you nibble on it!! !